If you’re a keen paddler or new to kayaking, a great option for going out on a river or lake is a recreational kayak. The best recreational kayak is one that provides a great deal of stability, relative comfort and ease of control. 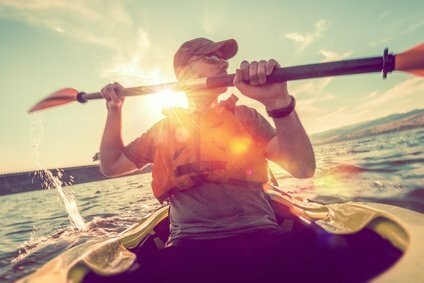 In this article we will be discussing the points you need to think about before buying one, and showing some recreational kayak reviews to help you choose the one for you. 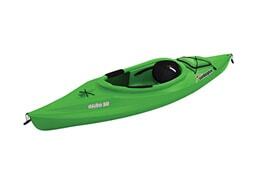 There are two main different types of kayaks that are designed to be used in varying ways. Touring boats are longer and faster but need practice to use properly, while recreational kayaks are shorter, lighter, and offer a much steadier ride without anywhere near as much chance of falling into the water. They are comfortable, have storage room, and are the best kayaks for beginners because no prior training is necessary. This sturdiness means they can be used for different activities while out on the water such as fishing and photography. Recreational kayaks are great for day trips and are most suited to use on canals, lakes, sheltered coastlines and other areas of calm water. The open cockpit design and their shorter length means that they are not so suited for use in choppier conditions. If you’ve decided that a recreational one is for you, then the next thing to decide when choosing a kayak is where you want to be sitting as you paddle. The two options are to sit on top, or sit inside. Sit on top kayaks are much easier to use for beginners and feel very stable on the water. The seat is raised, and your legs rest on top of the kayak without being surrounded. They are ideal if you want to be getting in and out of the boat a lot, even from the water. Of course, by not being surrounded by the kayak, you’ll find yourself being splashed a lot, and will need to wear a wetsuit if you are paddling in cold environments. Sit inside kayaks, on the other hand, will keep you much drier because you won’t be as exposed. The seat is lower, the sides surround you and your legs extend inside the boat. You will also be able to use a spray skirt to keep you even drier, and they will usually have a good amount of enclosed storage space. Sit inside kayaks are also a lot easier to control, and more efficient with the way that you are able to paddle. One of the great things about recreational kayaks is that they are stable and sturdy enough to carry gear with you. With a sit on top kayak, for example, you could take your dog out on a paddle with you or large object like a cooler or your fishing gear. The more weight you carry with you, the slower you will move, but sit on top kayaks let you carry larger, irregular things. Sit inside kayaks are better for storing the smaller, more valuable cargo. Say, for instance, you are a photographer looking to track down wildlife at a lake. A sit inside kayak gives storage within the cockpit, which will be much drier than you would get by sitting on top. This will keep the delicate equipment safe, especially if used with a spray skirt. When choosing the best all around kayak there are certain sizes and weights you need to consider. The first thing you should be aware of is the amount of weight that needs to be carried in the kayak (including you and your gear). Kayaks are rated for the maximum weight they can carry, and some manufacturers will offer different sizes of boat to accommodate more. The more weight and lower the boat in the water, the slower you will move and the more likely it is that water will get into the kayak. You also need to be aware of the size and weight of the kayak. After all, you will need somewhere to store it at home and a way to get it to the where you will be paddling. As long as it can fit on top of your car, a kayak will be easy to lift on top if you have two people for the job. If it will be just you, though, you will need to ensure that you will be able to lift the weight. You could, of course, use a trailer on the back of your car to transport it so things are a lot easier, but this will incur a further cost. You will want to get the best all around kayak, but the environment you intend to use it in will make a difference on the type that you get. Recreational kayaks are only really suitable for calm conditions. They will be stable and responsive on flat water. If it’s cold you will want a sit inside kayak that gives you a surrounding and the option to use a spray skirt to stop you from getting as wet, but in warmer climates a sit on top kayak is really good because you will be out in the open, can dip your feet in the water and so on. If you are planning to visit areas that are unprotected and windy, you may not find that a recreational kayak meets your needs, as longer boats are far better at coping with those environments.​. If your primary objective is to fish from your kayak, then a ﻿﻿fishing kayak might be a better choice. 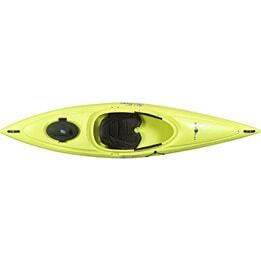 This kayak from Sun Dolphin is perfect for getting on the water. It’s a sit-in design so prevents you from getting as wet, and is faster and more controlled through the water. It’s made from a high density polyethylene so you will have the confidence to paddle without risk of cracks developing from a jagged rock. This kayak ticks all the boxes a best recreational kayak should. This model is available in 5 different bright colors, so you’ll be able to get one to suit your tastes. The large cockpit is great, because you don’t feel cramped inside it and there’s extra room to store your gear. There’s also shock cord deck rigging that adds further room to carry things with you. The padded seat is really comfortable with its high back support, and the whole thing is adjustable, alongside the foot braces, to ensure you fit snugly inside it. For further convenience there is a water bottle holder, and carrying handles to assist with moving the kayak between your car and the lake. 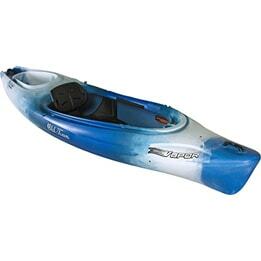 This kayak from Old Town is a versatile boat that would be perfect for recreational paddlers looking for a comfortable way to explore waterways. It is made from a highly durable polyethylene material that feels sturdy and safe, and is easy to paddle and control. It is a sit-in design with an adjustable comfort flex seat that will ensure you feel great no matter how long you are on the water. A nice addition is the thigh and knee pads within the cockpit that prevent any accidental knocks and scrapes, and the adjustable foot straps that make sure you comfortably fit inside. The cockpit rim paddle rest is really handy, because it means you can take a break whenever you like without having to put the paddles anywhere else, and will be ready to go again when you’re ready to. Sun Dolphin have created an easy to use kayak that is a great one to consider if you want to visit small streams or lakes. It is a sit-on-top design that allows for freedom of movement and storage of all you gear on top, and is one of the best kayaks for beginners. This kayak has lots of storage. There’s a dry compartment to keep the valuable object that can’t get wet, and shock cord deck rigging to hold the rest of your gear. If this isn’t enough, you will also get a portable accessory carrier that can be worn as a backpack or towed in the water behind the kayak and allows you to take a lot more with you. This kayak has been designed by Old Town to provide a versatile, closed cockpit option for recreational and novice paddlers. It has an aggressively shaped keel that allows for precise movement through the water, with the flared hull ensuring that you will feel stable, even in slightly more choppy waters. The comfort flex seat is perfect for long periods on the water, and it is fully adjustable to ensure you snugly fit inside. The foot braces are also adjustable, and the cockpit has thigh pads to prevent your legs from bumps or scrapes. ​The carrying handles make it really easy to transport this kayak, and it’s made from a lightweight material so won’t be a strain to move from your car to the waterfront. 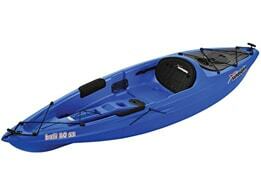 This boat from Lifetime is lightweight, low cost, and is the ideal first kayak for youngsters above the age of 5. It is made from a high density polyethylene so will feel safe and sturdy, and is easy to steer because of the twin fin design. It is really easy to use. Weighing only 18 pounds, there will be no problem carrying this kayak to the waterfront with the molded finger handles that are on each side. If portability what you are looking for, you might consider the lightweight and versatile i﻿nflatable ﻿k﻿ayaks. The multiple footrest positions and padded seat means that the kids will be comfortable while on the water, and the cockpit is designed in a way to allow them to efficiently paddle. Whether for fitness or for exploration, recreational kayaks are a great way to get out onto the water in a safe way. 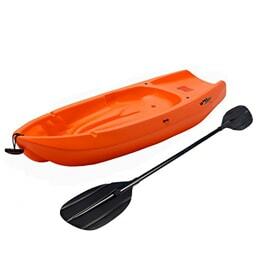 They are very stable, and the best recreational kayak will provide lots of storage room, be easy to steer, and feel sturdy as you pass through the waves.